The Portland Winterhawks saw goaltender Joel Hofer and center Josh Paterson arrive in Prince Albert, Saskatchewan and put them to work in their very first games in a Hawks sweater. Josh didn’t score, but he picked up a minor penalty and Hofer stopped 24 of 27 shots, but in the end the Hawks lost 4-2. It started with a Seth Jarvis goal just past the six minute mark, but two by Prince Albert midway through the frame gave them the lead. That lead was relinquished late in the first when Jake Gricius broke the goose egg that had haunted them on the powerplay as he tied things up. It remained that way until the third period where Prince Albert regained the lead near the midway point of the period and capped the game with an empty-net goal to seal the deal. The shots were tight at 29-27 in the Hawks’ favor and one goal for Portland on five attempts on the powerplay contrasted a zilch for Prince Albert on their 3 powerplay chances. Ninety minutes down the road in Saskatoon, it was honoring the Native population and Robbie Delorme and Jaydon Dureau of the Hawks were bestowed traditional blankets by the Chiefs at Center Ice pregame. Josh Delorme played in the game and saw Joel Hofer as the backup to Shane Farkas as the two teams got to business in the game. Two goals by Saskatoon gave them the go ahead, but Seth Jarvis was able to carve into that lead with just over 40 seconds to play in the first. Early in the second, the powerplay hit for Saskatoon and a two-goal lead was restored. John Paterson showed the Hawks why they traded for him with a pair of powerplay goals just over three minutes apart and Mason Mannek added a late goal to give the Hawks their first lead. That lead didn’t last as Saskatoon closed the period with a late goal of their own to tie the game. The third period was a seesaw battle with both teams looking to gain the lead, but to no avail. With just two and a half minutes remaining in regulation, Mason Mannek turned the flow his way and sent his second of the night past Nolan Meier to once again give them the lead. 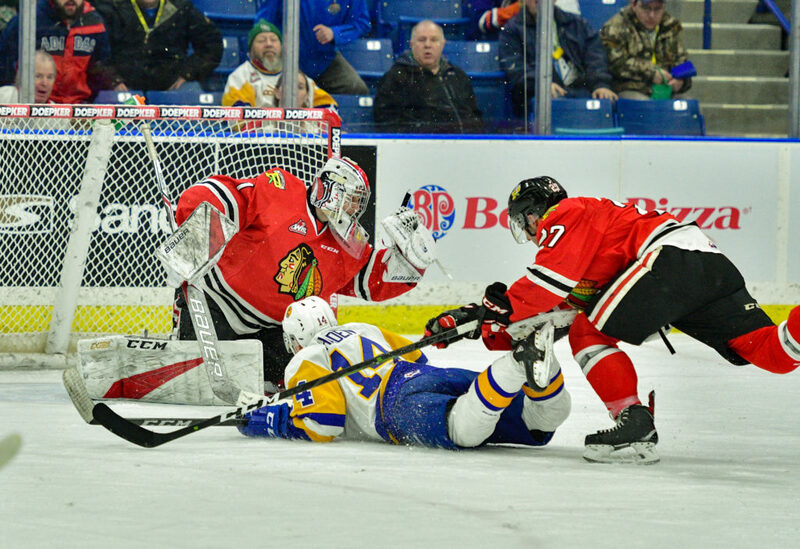 It was a nailbiter as the Hawks used a few icing calls and had heroic saves by Shane Farkas and a lucky bounce here and there to secure the win and take five of six on the swing with a 5-4 win. The Hawks play two weekends in a row at home with a Wednesday game as well to close out January. Two games at the start of the month will lead them to a a split of road and home games in the month of February. Dean Scooter Vrooman will be on hand February 22 during the Tri City game in Gresham at Pour Sports (Formerly Kelley Creek Sports Grill) giving away a Cody Glass team signed stick. Scooter will make two appearances in March as well. Players and Rosebuds will be at Les Schwab locations on Tuesday, February 12, 4105 SE Powell Blvd and 8910 SW Barbur Blvd, from 4 until 6. The Portland Winterhawks Booster Club will promote the Membership Drive starting in early February.